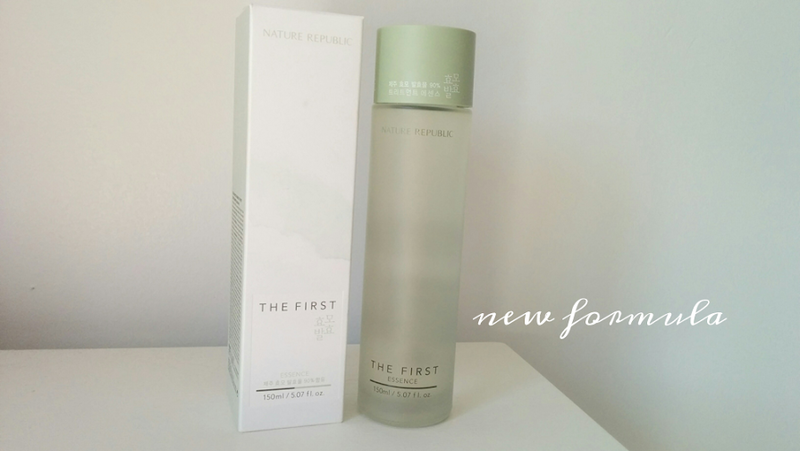 Nature Republic recently came out with a new formulated and packaged version of their original The First Essence (which I reviewed here). This new formulation is meant to replace the original version of the fermented essence. There are only a few differences between the original and new one. Bottle Size: The older bottle was slimmer and taller while the older version is shorter and wider. The newer version in my opinion, has a better feel to it. The green bottle-top feels nicer when you're opening the product. Saccharomyces Concentration: The new version has an increased fermented yeast concentration of 90% compared to the older 87%. Price: The price has increased quite a bit at $36 from the older $28 price tag. I suspect it's due to the higher Saccharomyces concentration of 90%. While a 3% jump is actually significant since we're already in high percentage concentration levels, I hope that Nature Republic will keep the price below $40 for any possible future versions. Ingredients: The ingredients are relatively the same, except that the newer formula has the addition of "orange fruit water" from Italy. I'm not sure what the orange fruit water does exactly, but I'm guessing it has something to do with the presence of vitamin C.
Size/Volume: The amount of product you get is still the same at 5.07 oz (150 ml). Scent: The scent between the two products is the same as well. 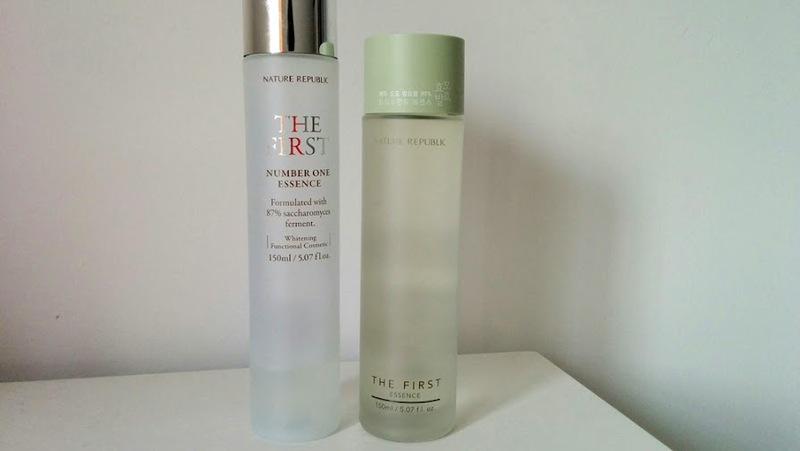 "The First Essence" vs. "The First Essential Skin"
When I went into the store to purchase the new essence, I also saw another product called "The First Essential Skin." The difference between the two products is the texture - the Essence is like water while the Essential Skin is slightly more thicker and jelly like. The Sales Associate told me that the Essential Skin would be for those who need more moisturization from a fermented essence. If you're looking to buy the traditional water-like essence, make sure you're purchasing "The First Essence." As I mentioned in the original post, if you live in the New York area, there are two Nature Republic storefronts, one in Chinatown and one in Flushing, Queens. 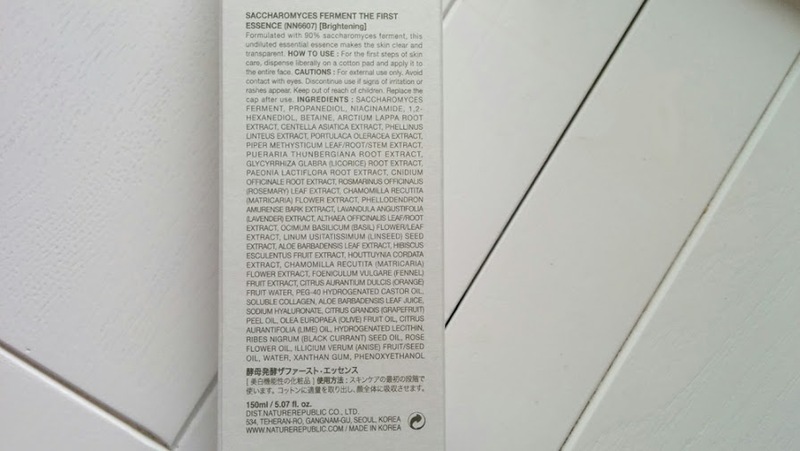 Amazon and Ebay are still the best options if you would like to purchase the new reformulated Nature Republic Essence. If you want to see other options for similar fermented essences, check out my post here! Have you tried the Emulsion? Yes actually I have! The original bottle came with a deluxe sized sample of the toner and emulsion which I used for around a month. I liked the texture of the emulsion (like a sticky serum) but I decided not to buy it sine I didn't see it making a difference on my skin.